The story offers this possible end game; "And that is where the auction process comes into play. 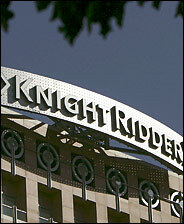 Perhaps private equity companies will see an opportunity to buy and break up Knight Ridder. Perhaps other media companies will bid. The quality of news provided to millions of Americans may depend on who buys the papers and how they are managed." E.W. Scripps' Commercial Appeal in Memphis, Tenn., is the latest newspaper to offer buyouts to employees in an effort to cut costs. President and Publisher Joe Pepe said the paper would offer a package to about 170 of the paper's 800 employees, although no target has been set. Press lord Conrad Black and three other executives were charged in a federal fraud indictment Thursday involving the $2.1 billion sale of several hundred Canadian newspapers and the abuse of corporate perquisites at newspaper publishing company Hollinger International Inc.
Read the previous column on the Knight Ridder debacle "The Mating Sounds of Dinosaurs" here. Postscript: The chain was sold in March, 2006, to McClatchy, the only bidder.